Colombia is stunningly beautiful, great fun and an amazing place to visit as a traveller or backpacker. However, as it’s such a large country, planning a trip there can be overwhelming, with so many options for places to see and things to do. A lot of people have asked me what places I would recommend travelers visit on a trip to Colombia, so I decided to put together this list to help narrow down the options. Cartagena is a fantastic entry point to Colombia as it’s everything you expect this tropical country to be; colourful, full of energy, pulsating to the beat of Afro-Caribbean rhythms and stunningly beautiful. Enjoy the colonial Old Town before setting off on a day trip to the magnificent Rosario Islands, where the water is so bright and clear, you really won’t believe your eyes. To read more about Cartagena, check out this post, or to see more beautiful photos, click here. Medellin is the epitome of a city that has completely reinvented itself; now proudly positioned as one of the best places to live in Colombia, with a rapidly growing number of foreign expats, and voted as the ‘Worlds Most Innovative City’ in 2012, it’s come a long long way from its drug cartel days. With beautiful and refreshing weather all year round, this ‘City of Eternal Spring’ has so much to offer, including a blossoming arts and culture scene, thriving science and education institutions, and plenty of museums, galleries and other public spaces designed with the citizen in mind. Make sure you also experience the Medellin nightlife as ‘Paisas‘ are famous in Colombia for their partying habits! Just a few hours from Medellin, Guatape and El Peñol are definitely worth a visit if just to witness the stunning views (above). Guatape is a small town with big character, as the kaleidoscopic streets overflow with colorful buildings, local art and homely restaurants. Set against a lake, it is the perfect place to spend the weekend away from the bigger cities. A short drive outside of Guatape is El Peñol, a gigantic rock mysteriously placed in the center of a sprawling piece of land dotted with several lakes. Climb all 659 steps to the top for the best views in Colombia! Click here for more info and photos of Guatape and El Peñol. The laid-back, ‘campesino’ town of Salento is located in the middle of Colombia’s famous Coffee Triangle; consisting of the regions Caldas, Quindío and Risaralda. Set amongst the mountains, the climate is cool and refreshing with local restaurants serving up hot soups and, of course, coffee to battle the soft chill. Local coffee farmers, known as campesino’s, walk around in poncho’s and ‘sombreros vueltiaos’; a typical, traditional hat worn by Colombian farmers. Spend a few days exploring the coffee region, taking day trips to the beautiful Valle del Cocora, the fun Coffee Park, or one of several other towns within the coffee triangle. Hard to get to, but totally worth it, Cabo de la Vela is like nowhere else in Colombia. Situated in the most northern part of the country, the Guajira Peninsula, Cabo de la Vela is a desert wasteland, home to the fascinating and talented Wayúu indigenous people and, frankly, not much else. A unique landscape where the desert meets the sea in peaceful harmony, Cabo de la Vela is an adventure travelers dream destination. While you’re there, take it one step further by visiting Punta Gallinas; officially the most northern tip of Colombia and the entire continent of South America! Read more about Cabo de la Vela and how to get there in this post. Tayrona is paradise on earth! This national park, containing tropical rainforest, snow-capped mountains and hugged by the Caribbean Sea is the most picturesque area in Colombia, in my humble opinion. Full of beautiful beaches, mostly isolated, and free from any major development apart from eco-friendly huts, Tayrona is a place for relaxing, unwinding and getting away from the everyday hustle of life. Grab a tent, walk two hours into the jungle until you reach the pristine white sand beaches, hang up your hammock and relax for a few days in Caribbean bliss! If you’re visiting Colombia, ensure to make some time in your schedule for this gorgeous part of the country. And before you go, check out my Ultimate Guide to Tayrona National Natural Park. Often overlooked in favour of its larger counterparts, Bogota and Medellin, Cali may not be as popular with tourists but it’s got its own secret weapon that can’t be ignored, or replicated; salsa! The World Capital of Salsa buzzes with an infectious energy for life, as its friendly residents sing and dance their way through the hot, aguardiente-fuelled nights. If you’re a fan of salsa dancing, you can’t pass up the opportunity to visit the World Capital of Salsa, where the World Champions are treated like Olympians and everybody….yes, everybody dances! Every year during the first and second week of January, the city of Pasto becomes the world’s biggest playground and pure madness ensues! The Carnaval de Negros y Blancos is the most fun event I have ever attended in Colombia; yet hardly anyone outside of the country has ever heard of it. From colorful street parades, to epic foam fights on the streets with strangers, the atmosphere in Pasto during the carnival is truly amazing. If you’re in the south of Colombia during the New Year, make sure you get to Pasto on time for the Carnaval de Negros y Blancos! For lots more colorful photos from the Carnival, check out my photo post here. The religious capital of Colombia during Easter Week, Popayán impresses thousands of visitors each year with its magnificent street processions during Holy Week. Thousands of Colombians and foreign visitors descend on ‘The White City’ to watch, participate in and gaze in awe at impressive ‘pasos’ that pass through the town every night from Tuesday to Saturday of Easter Week. The effort, dedication and devotion to the processions that is displayed by the locals of Popayán is really admirable. The city itself is beautiful, consisting almost entirely of white colonial buildings in the center of the city. Bring some rain gear though, as it rains almost every day here! 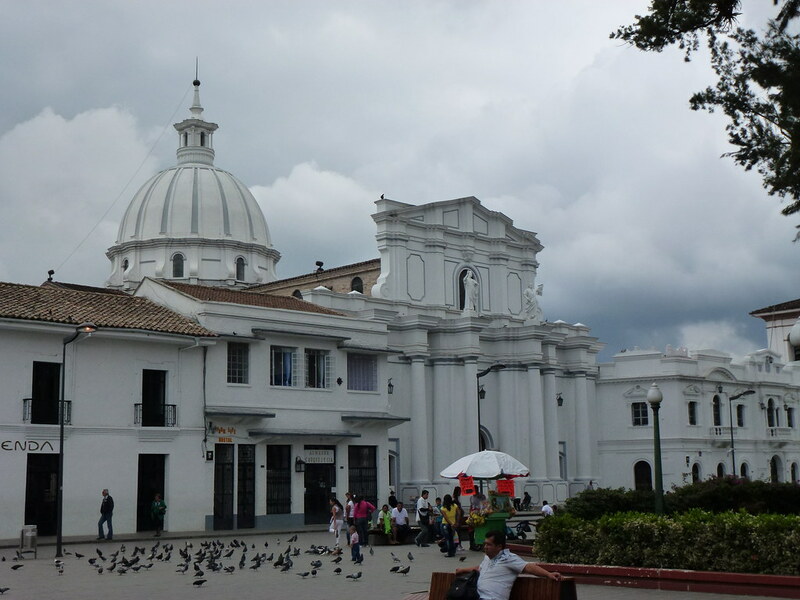 Read more about Popayan during Easter Week here. Like a town taken straight from the pages of a Gabriel Garcia Marquez novel, Mompox (Mompos) is a sleepy, swelteringly hot and quiet town situated on an island on the Magdalena River. Admire the colonial buildings, chat with the locals swaying on their rocking chairs in the shade, or visit one of the workshops where they produce the countries finest filigree jewelry. A visit to Mompox is laid-back and relaxing, offering another glimpse into life in the more remote and lesser-known areas of Colombia. To see more photos and read about this town, check out my second ever post on the blog, direct from Mompox. Do you agree with my top 10 places to visit in Colombia? Would you add anywhere else to the list? I cannot get Colombia out of my mind at the minute and this had made me crave being back in Colombia even more! I completely agree with your list, Cabo de la Vela in particular is probably my favourite trip ever and Medellín is my second home. I will hopefully be back in October (fingers crossed!) so I will resolve the craving then! My partner and I spent 10 months in South America last year, but we didn’t have a chance to visit Colombia before we had to return to Europe…and I so wish we had! It’s still somewhere I’m dying to go, so this post will be extremely useful when we finally make it there! I’m especially looking forward to visit Medellín, and anywhere out of a García Márquez novel would be right up my street! I visited Colombia last year and fell in love with the country. The old city of Cartagena is beautiful and Tayrona was like a paradise, hopefully it won’t be too long until I can go back! I love the look of Medellin actually. I never knew it had such stunning surroundings. The espuma fights during carnival seem to be omnipresent throughout South America. I was in Bolivia during carnival and for a whole months I had espuma and water battles with the locals, which was great fun. Great list and read. I have been hearing more and more on Columbia lately. Seems to really be a hot destination now. On my list for sure. Beautiful pictures and a great list! I’m bookmarking this for my trip to Colombia *hopefully* this November! Krista recently posted..Sugar Beach – A Must See When Visiting St. Lucia! Yes Colombia is not Columbia. That is really disrespectful to Colombians like me. Look, I am romanian and in romanian the translation for the name of your country is Columbia, so ofr example I am used to say Columbia instead of Colombia you see, you shouldn’t see it as disrespectful, it’s just something about habit. 3) Barichara – beautiful small town that looks like a Tuscan Hill town. Great hike to Guane skirting a canyon. Colourful sculpture garden. We missed Medellin so will definitely have to visit next time. I completely agree that Tayrona is paradise on earth! Loved that beautiful place! Emma recently posted..Is Bogotá really the WORST holiday destination? I have a question – i am going to medellin for 6 nights. I want to leave there for a portion of the time to go to a beach. I want nightlife and decent food ideally – but also a good experience. Should i go to tayrona and sleep in a hammock (im so not a backpacker but i “think” i could manage this?) or just go to cartagena. I have always thought cartagena looked really beautiful, but then heard it’s just really dirty and full of hookers. What do you recommend? I have traveled almost every where, and there is something about Colombia that keeps me coming back. Colombia is the most beautiful South American country I have ever been and the people are the most kindest and well mannered. Now regarding your question Amanda if your going for 6 night stay in Medellin because your going to need all 6 nights there, Medellin has plenty to seen and plenty of night life, try the cable cars that take you over the mountains its breathtaking, go to el peñol another breathtaking place. I try to go to Colombia every year to different place at different dates, like if you go to Cali at the end of the year it amazing. Hope you have fun, happy traveling. You are totally correct Cali at the end of the year is the craziest. I come from that place and every time I spend New Years or Christmas Eve with my family is the craziest thing ever. Carnivals at night and then Fireworks everywhere. And in the mountains is the most beautiful during the night because is romantic. Tayrona NP is one of my favorite places in the world. I would also add San Gil to this list. Have you been there. It was a paradise for outdoors activities and still pretty undiscovered. You made me miss Colombia! Colombia how I miss you and I’m not even Colombian, but the people there are the most beautiful people I have ever seen when I have traveled to South America, Cali a beautiful place, Cartagena love the old town look, Bogota not my bad it ok, and Medellin amazes me. Such a great list. Thank you Stephanie! I plan on spending 2 months in Columbia in Feb 2016. If anyone knows of a yoga retreat or dive center that could use some extra assistance in exchange for room and board, please let me know! Feel free to learn more about why I hope to contribute my skills in Columbia at growthtrotter.com. I Come from Colombia, Cali and I totally agree with you when it comes to SALSA and us the Caleños. I love this country. I’ve being in the U.S.A for 4 years and a half and missing Colombia is something that happens every day. You will love it. I promise you. Colombia might have bad people but in reality, the place itself is what counts. The beauty of this country is amazing more if you go up to Barranquilla or Cartagena. Amazing places. And before you go try to learn a little bit of Spanish, because some people or most of the people in Colombia don’t speak English. Oh, and the food is the best. Don’t be afraid to try new things go for it, is really good. And also the braids that they do there are cool, so check it out. Is a beautiful and romantic place. Looking to be trying to have work online and have the independant life. Dream, dream dream………..
What about Leticia….how could you leave that out? Unfortunately I’ve never been to Leticia Mary! Would love to go next time, got any good tips? One of the best things about Colombia is that you can do many different activities. You can find any type of landscapes, either the amazing beaches, big cities, incredible nature, whatever. If you want to know more about our culture and what to do in Colombia contact us. You know, Colombia has something that will satisfy most travelers! I think there is no traveler who does not love sandy beaches of the Caribbean and Pacific coasts, to the Andes Mountains and the Amazon rainforests. Thanks a lot for this amazing blog! Awesome post! We’re planning our first trip to Colombia this summer and looking to do some travel in between hunkering down in Medellin to work for a month or two. We’ll definitely check some of these places out and have your site bookmarked for future reading. Muchas gracias!